This is a big weekend for the Catamounts as they travel to Charleston to play the 6th place Cougars. The Cats need to win (a sweep would help greatly) this series to keep alive it's hope for a spot in the SoCon tournament. Western has not had a great deal of success against the Cougars in Southern Conference play, and currently owns a 15-30 record against Charleston. If we have strong pitching against the Cougars, as we have since the Davidson series, this weekend could be very good for the Catamounts win loss record. The Cats exploded for 11 runs in the first four innings, then held High Point scoreless for a 11-0 victory in nonconference play Tuesday night at Hennon Stadium. Starting pitcher Preston Hatcher picked up the win with the help of Matt Johns' 4 RBIs. With the loss High Point remains winless against the Catamounts in their Division I era. The Catamoounts return to Southern Conference action this weekend as it travels to the South Carolina Lowcountry to face the College of Charleston Cougars. Last week's rain forced a practice cancellation that the Cats made up by holding a scrimmage session on Sunday, and then practiced again Monday (sessions 6 & 7 of 15). Both sessions were held with full pads, and work continues on the new "pistol" formation, with quarterbacks Brandon Pechloff, Zac Brindise, Lance Price and Brock Frisbee taking turns in the pistol formation. The drills will culminate on Saturday, April 16 with the final practice session that will be open to the public and a Catamount Club cookout held after the practice with the team and coaches. The Catamounts took game one by a score of 7-1 in Sunday's double header, to secure the series win over Davidson. However, the Cats fell in the second game 3-0, in 10 innings. The Cats never trailed in the first game, getting 7 runs off 14 hits. In the second game of the day, the two teams battled to scoreless deadlock through the top of the 10th inning. Davidson's Kelly Myers hit a three-run, walk off home run in the bottom of the 10th to lift the Wildcats to a 3-0 win in the nightcap, snapping WCU's 15-game winning streak in the head-to-head series. Freshman Morgan Wyatt's grand-slam homerun set up the Cats' first conference win of the season, 8-7 over Samford on Sunday at Bulldog Field. The victory ended a 9 game losing streak in conference play. Bekah Burkett picked up the win, and Katie King was credited with a save for the Catamounts. The Catamounts flexed their muscles in the Beynon Sports Surfaces Catamount Classic held in Cullowhee at the Catamount Sports Complex on Saturday and dominated the day with 19 wins and 74 top-five finishes. The field for Saturday's meet featured nine teams from around the Southeast. Special recognition goes to both Zakiyyah Bryant and Jamie Van Pelt for earning three victories each at the meet. The Catamounts were swept in double header action by Samford at Bulldog Field. Saturday's action leaves the Cats with out a conference victory thus far this season at 0-8. Western Carolina completes the series with Samford on Sunday at 2 p.m.
Matt Benedict established a career-high 13 strikeouts, leading the Catamount to a 2-1 victory over Davidson before a crowd of 283 at Wilson Field in Davidson, NC on Friday night. Junior Ross Heffley slammed a RBI single up the middle in the top of the sixth inning that scored Austin Schultz in what proved to be the game-winning run. This win gave the Catamount their first Southern Conference baseball victory of the season and upped their record to 1-6 in conference play, 9-10-1 overall. WCU head football coach Dennis Wagner recently announced the addition of three new staff members to the Catamount football coaching staff. Jay Hood comes to Catamount football from Ball State, Kenyon Blue from Idaho State, and Jeff Pitman from the University of Colorado. Hood replaces former linebackers coach Justin Roberts, and his primary responsibility will be linebackers. Defensive assistant Kenyon Blue will work primarily with the corner backs in the secondary and Jeff Pitman has assumed the role of and strength conditioning coordinator for the Catamounts. Gardner-Webb jumped out to an early 7-1 lead Wednesday, but the Catamounts scored two in the bottom of the ninth to tie the game. The Cats had the winning run on second base and two outs in the bottom of the tenth inning when the game was called for good - reverting all stats back to the end of the ninth. Nicole Okolo and Cordell Livingston have been named Southern Conference Outdoor Track Athletes of the Week. Okolo, a senior and Lawrenceville, Ga., native, ran a personal-best in the 100m hurdles with a time of 13.84 at the UNCC 49er Classic. Livingston, a sophomore from High Point, N.C., won the 400m hurdles at the UNCC 49er Classic over the weekend. Both will be back in action this weekend in Cullowhee, as the WCU Track and Field teams hosts the Beynon Sports Surfaces Catamount Classic beginning Saturday morning. Monday afternoon the Cats completed the fourth practice of the fifteen scheduled for the spring session, with the offense continuing to install components of its new system, the "pistol." On Wednesday of this week, the team will go into full pads for the first time. Spring drills continue through mid-April with the squad to hold an open practice session on Saturday, April 16 on campus. The Cats just could not overcome falling behind 7 runs in the early innings; committing 4 errors; 9 walks; and 12 runners left on base. Thus they dropped their third game to Elon Sunday afternoon in front of a home crowd of 211. The Cats did stage a ninth inning rally of sorts, loading the bases and scoring 2 runs to pull with in three of Elon, however the Phoenix held off the Catamount rally to seal the win and sweep the Catamounts in Cullowhee. WCU's men & womens outdoor track & field teams kicked off the outdoor season at the Charlotte 49er Classic on Saturday. Highlights include, sophomore Cordell Livingston winningn the 400-meter hurdles, and freshman Jordan Orr picking up a victory in the men's high jump, while the men's team swept the relays, picking up wins in the 4x100-meter relay and the 4x400-meter relay. WCU Baseball and Softball went 0-3 Saturday, with the Catamount men losing 5-4 to Elon, and the Catamount women swept in a double header by Georgia Southern (1-0, and 6-5). Saturday's losses by both teams drop each of their records to 0-5 in conference play. Both teams return to action on Sunday for game three of both series. Having lost 2 of 3 in their respective series, both teams will battle to prevent being sweep in the series. A ninth inning home run to left center by Elon's Seth Canipe broke a 5-5 tie and lifted the Phoenix over the Catamounts by a single run in Friday's opening game of the series. The Cats out hit Elon 14 - 9, but left 10 runners stranded on base. Game two of the conference series is scheduled for 2:00 pm on Saturday afternoon. JW asked why Western did not get to participate in the end-of-the-year tournaments like other schools such as Davidson and Furman. The number of postseason tournaments has increased over the past few years, with the addition of the College Basketball Invitational and the College Insider Tournament. Both the NCAA and NIT tournaments are events that fully cover the cost of expenses for all the participants. Other tournaments work with the teams on a guarantee basis to provide revenue to pay for such expenses as travel for the teams that go on the road, officials and tournament expenses. We made the departmental decision not to incur financial obligations in order to participate in postseason play. JB asked if the end zones are always going to be plain purple. The original plans called for the end zones to have the logo and Western Carolina included in the design. However, that design did not look as good in reality as it did on paper and we made the decision at installation to leave them purple only. Since that time we have been able to identify specialty paints that will allow us to paint the end zones without damage to the surface, which we plan to do in the coming season. FL asked about picking up baseball game "broadcasts" online. We have streamed some of our baseball contests already this season. The links to the broadcast are on our webpage, www.catamount sports.com. The audio link is monitored during the broadcast to assure it is operational. If you have additional problems, please contact the sports information office. JK asked why we don't do more for player introductions prior to basketball games. The reason is that the lighting system in the Ramsey Center will not accommodate changing the lighting and spotlights as many arenas do. The good news is that those lights are scheduled to be replaced this spring and we should have a state-of-the-art system which will allow for some impressive introductions next season. TP asked about kickoff times for football games. Now that our football schedule is finally settled, we are putting together kickoff times for the 20011 season. We have had requests from some folks to have kickoffs later in the evening to allow them to drive from further distances and tailgate prior to the game. We also have had requests from other folks for kick-offs be earlier in the day in order to allow them to drive home before it's too late at night. Right now, we are looking at six o'clock kickoffs for early-season games to avoid the heat of the day, and later afternoon - maybe three o'clock - kickoffs for the remaining games. However, those times are tentative. You will be able to find the final dates and times at the website www.catamountsports.com within a few days. GL, AJ, AW, and Cat Fan all asked about any upcoming changes to the football stadium and press box. We try every year to make some changes to the appearance of Whitmire Stadium and Bob Water's Field. Obviously, the video board was our improvement for the previous season. The press box would be a major undertaking and is on our list of facility improvements but with no timetable to begin that work. The chain-link fence has been a topic of conversation for several years and we are looking at ways to make for a friendlier "feel" until more substantial changes can be made. Once again thanks to everyone who submitted questions. We appreciate the interest that is shown in the various aspects of the athletic department. Please continue to send in your questions, and GO CATAMOUNTS. The Catamounts were totally dominated by a 4 and 10 Asheville baseball team that was on a 10 game road losing streak. The Bulldogs last won against (another SoCon team) Greensboro, back on February 22, by a 3-0 score. Since that time, Asheville was swept by Campbell, lost to ETSU, swept by Charlotte, and lost one to Georgia State. It potentially will be ugly when Elon 12-6, (3-0) pays the Cats a weekend visit in Cullowhee. The Phoenix swept Appy State last weekend. The Cats split their home opener with Wilmington (5-18). Wilmington won the first game 8-2, and the Cats took the second game of the twin bill 7-1. KENNESAW, Ga. – Western Carolina scored three runs in the top of the first inning and held off Kennesaw State, 5-1, on Tuesday night at Stillwell Stadium. The Catamounts (8-6) got to Kennesaw State starter Travis Dean early as the freshman walked the leadoff hitter Austin Schultz before the next batter, Matt Johns, hit a two-run homer that landed on the deck of the Bailey Building for a two-run lead. Johns would finish the game with two hits and three runs batted in to lead Western Carolina. Western Carolina opened its football Spring Drills on Monday afternoon on the turf at Bob Waters Field/E.J. Whitmire Stadium. "We had a great first day of practice, great weather - couldn't have asked for better. It seems like the winter went on forever. It is great to be back out here working together as a team this spring," said WCU head coach Dennis Wagner Monday evening following his squad's first of 15 practice sessions. "The biggest thing for us right now is coming out and competing every day." The Cats will conduct spring practices every Monday, Wednesday and Friday from 5:00 pm until 7:00 pm. The squad breaks out the shoulder pads on Friday before getting into full pads next week, although full contact will be limited. Western Carolina women’s tennis team defeated Davidson Sunday 4-3. This is the teams first SoCon of the young season. The match marked the first victory this season in Cullowhee, and its first over Davidson in over 10 years. “…the Spartans plated nine runs in its final four frames including tying the game with a four-run sixth inning as UNCG completed the three-game sweep of the Catamounts with a 9-6 victory Sunday afternoon in Southern Conference action. It was the second-straight year that the Catamounts have dropped a seasonal series to UNCG, with the Spartans sweeping WCU for the first-time since 2004. "We will be going through this spring with limited numbers which will change our focus somewhat," said Wagner of his plans for this year's spring practice. "Our intention will be to focus on fundamentals and techniques while implementing the new ideas and strategies from our staff development trips." Western Carolina received a lift from its bench, rallying for four runs in the final two frames but the Catamounts could not overcome an early deficit and a solid starting pitching effort by UNC Greensboro's Warren Slack. Freshmen Dykota Spiess and Adam Martin both homered in the eighth and ninth innings, respectively, as WCU dropped its Southern Conference opener at UNC Greensboro, 5-4, Friday night. One year old today !!! 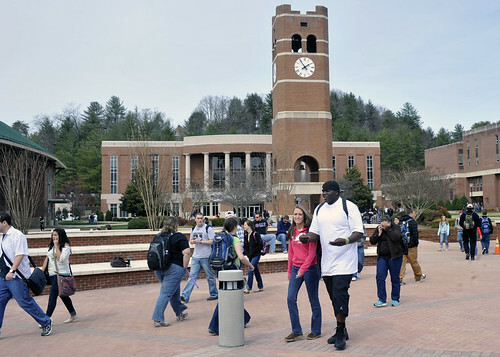 Students pass through the new courtyard located in the center part of campus. The Catamount Golf Tour was established in 2008 to help organize each of the golf tournaments WCU alumni and supporters host throughout the Spring and Summer. The events are a great opportunity to rally our Alumni, Fans, and WCU Coaches together to generate excitement for the upcoming year with WCU. All of the proceeds from each tournament will benefit the Catamount Athletic Scholarship Fund. The Catamount Golf Tour has raised over $130,000 during its existence! With another great Tournament Schedule for 2011, we anticipate this year's Catamount Golf Tour to be even more successful. Rain across the southeast region has prompted officials at Western Carolina University to postpone today's scheduled baseball game between the Catamounts and the eighth-ranked Clemson Tigers at Childress Field / Hennon Stadium. The two squads have agreed to reschedule the game for Wednesday, April 27 in Cullowhee. It is the third-straight game that WCU has had rained out this week as tournament games against both Ohio State and Army slated for last weekend at McNair Field in Forest City were cancelled due to weather. Chattanooga, Tenn. - Western Carolina senior Mike Williams and redshirt junior Harouna Mutombo were named to the Southern Conference All-Tournament team Monday night at the conclusion of the 2011 men's basketball championship at UTC's McKenzie Arena. Both earned second team plaudits as the 10-member squad was comprised completely of players on squads that advanced to the SoCon semifinals. The Catamounts and Tigers will play in Cullowhee on Wednesday. Prior to the game, Western will unveil former WCU and now Clemson Head Coach Jack Leggett’s jersey # 7, which will hang alongside the only retired number in Catamount baseball history – the #23 worn by the late Keith LeClair, the former WCU player and coach – on the leftfield fence at Childress Field/Hennon Stadium. The Tigers are 7-2 this season, after having defeated Wofford (5-1), and split with South Carolina (3-6, 10-1). CHATTANOOGA, TENN — Wofford seized control with a 13-1 run midway through the first half, and Western Carolina never recovered this evening at the Southern Conference men’s basketball tournament. The Terriers held onto that early momentum and earned a 86-72 victory, elminating the Catamounts in the semifinals for the second straight year. The Catamounts depart the tournament as Coastal Carolina Tournament Champions after going 4-0. It is the second time this season Western Carolina has gone undefeated in tournament. Western Carolina opened 2011 sweeping a tournament hosted by North Carolina Central. “Harouna Mutombo led four Catamounts in double figures with 20 points as North Division top-seed Western Carolina advanced to Sunday's semifinal round with a 77-66 victory over the North's sixth seed UNC Greensboro on Saturday afternoon at the McKenzie Arena. CONWAY, S.C. - Sophomore catcher Haley Pace hit a grand-slam, in the top of the seventh inning, to lead Western Carolina softball (12-6) to a day two sweep at the Coastal Softball Tournament, defeating Delaware 2-0 (3-8) and downing host Coastal Carolina (12-6) 7-3. CONWAY, S.C. - Western Carolina softball (10-6) swept day one action at the Coastal Carolina Tournament defeating Towson (6-5) 4-3 and Delaware (2-6) 1-0 Friday. Sophomore outfielder Jordan Fulton broke the Catamount career stolen base record in the fifth inning against Delaware. After breaking the single-season record, with 16, in 2010, Fulton now tops the Catamounts in career stolen bases with 20 for the sixth year program at Western Carolina. Morganton, N.C. - Western Carolina men's and women's golf squads teamed to edge Appalachian State in the University Cup co-ed competition by a 3.5-to-2.5 margin on Thursday afternoon at the Mimosa Hills Country Club. It was the most tightly contested match of the five-year history of the University Cup. The Catamounts made it a clean sweep of the competition winning both the men's and women's side competitions. WCU sophomore Trey White was medalist for the day, firing a one-under par 71 to pace the Catamounts to a 300 four-man total to 311 for Appalachian. ASU junior Drew Harris shot an even-par 72 on the day. The women’s basketball won their fist round game today by a score of 48-42 over Georgia Southern. The Catamounts advance to the quarterfinals and will play #1 seed Samford on Friday morning at 9:30 am.